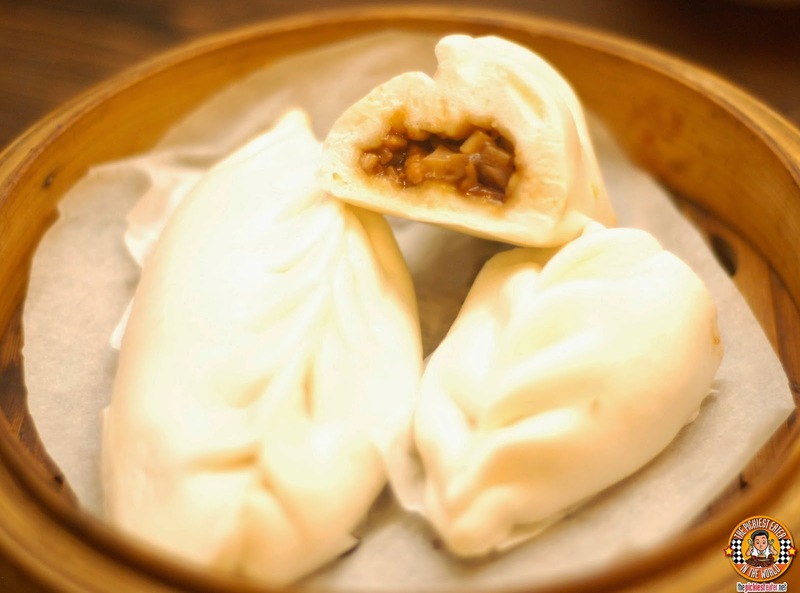 THE PICKIEST EATER IN THE WORLD: MODERN SHANGHAI: A GRAND DINE-ASTY! 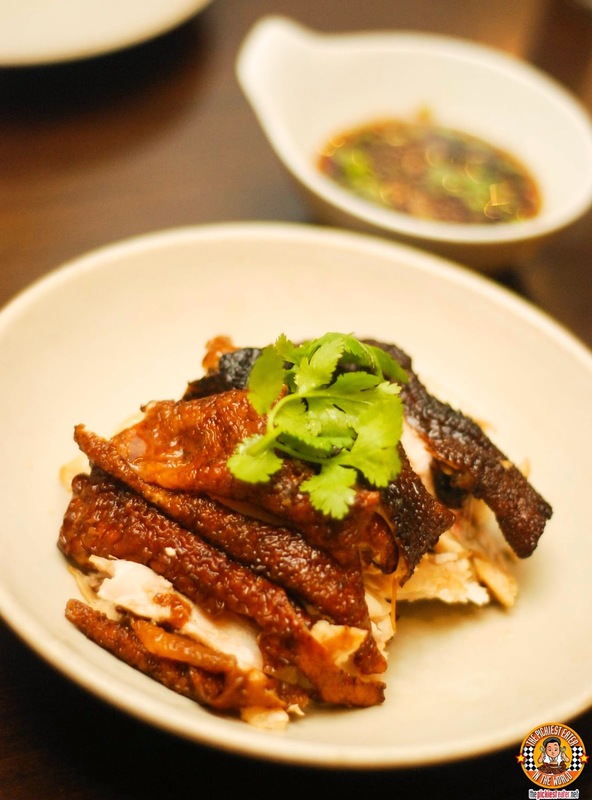 Modern Shanghai kicks off the new year by adding some new, delectable items to their already mouthwatering menu! 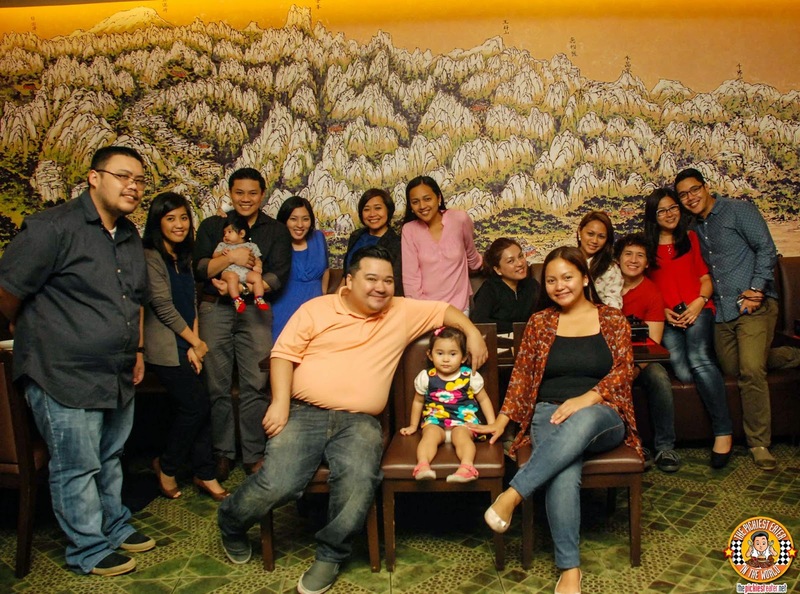 And what better way for me, Rina and my blogger friends to welcome 2015 (and my birthday) than trying Modern Shanghai's "Grand Dine-asty" dishes out for ourselves! Modern Shanghai is actually a franchise from Hong Kong that goes by the name, "Modern China. 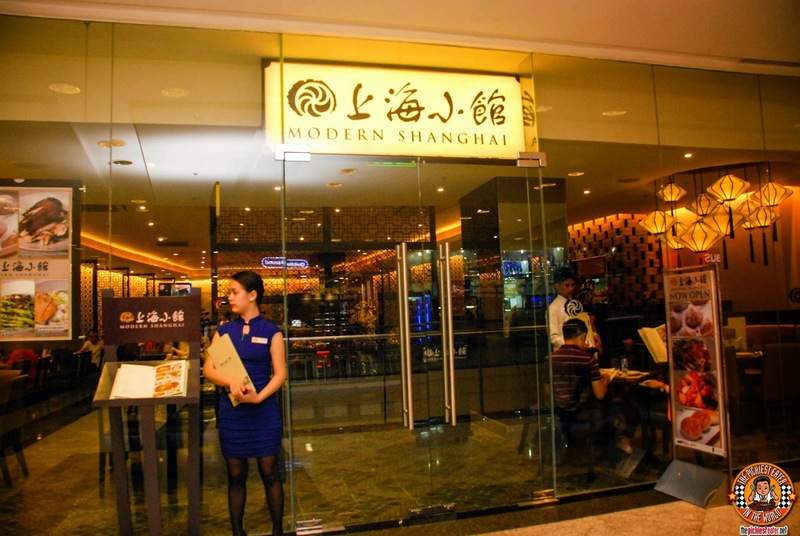 But since there already happens to be a restaurant that goes by that name here in the country, The Bistro Group re-christened it "Modern Shanghai". And with Chef Josh Boutwood at the helm of The Bistro Group's culinary operations, you can be rest assured that the menu will constantly be kept fresh and vibrant every time you visit. This time, we are taken on a trip through different parts of China through its selected dishes that comes from the country's specific provinces. This is around my fourth time to dine at Modern Shanghai, and I seem to discover a new item that makes it imperative to go back! 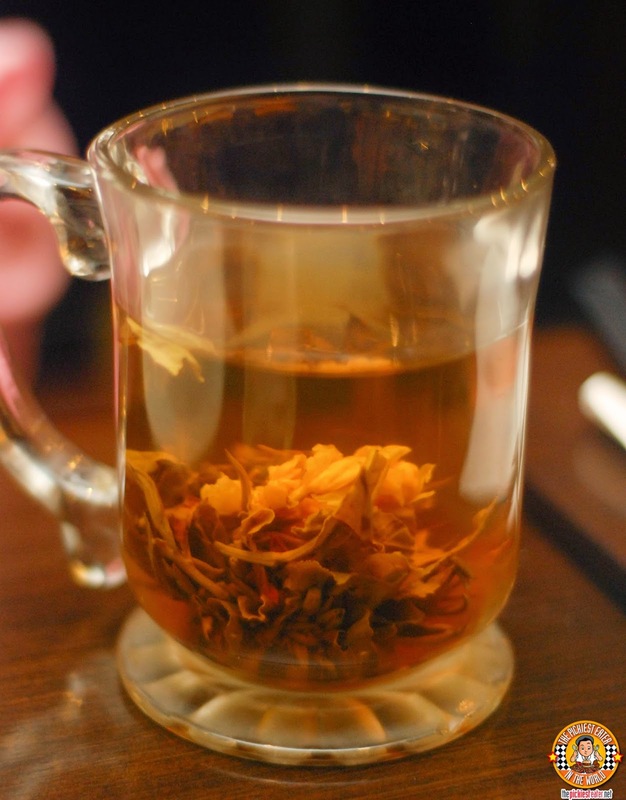 A unique item in the menu of Modern Shanghai is the "Peaceful Garden Blooming Tea". You are given an empty tea glass with a some dried herbs rolled up into a little ball. Hot water is then poured into the glass, and as you allow the tea to steep, the ball slowly blooms into what appears to be a beautiful flower. Not sure if this was a new item on the menu, but it was definitely new to me! For a glimpse of the process, check out the video from the Instagram account of my buddy Chuckie Dreyfus HERE. If you feel that Siopao has become too mainstream, you can opt to try the Old Fashioned Shandong Buns (2pcs for P128) instead. These pillowy soft buns are Steam-fried then filled with a luscious minced meat, and mixed bits of vegetables. The meat mixture had a nice sweetness to to go with its innate savoriness. Rina was quite surprised when I said I would give the Claypot Tofu (P348) a try. And I was actually glad I did because I quite enjoyed it. 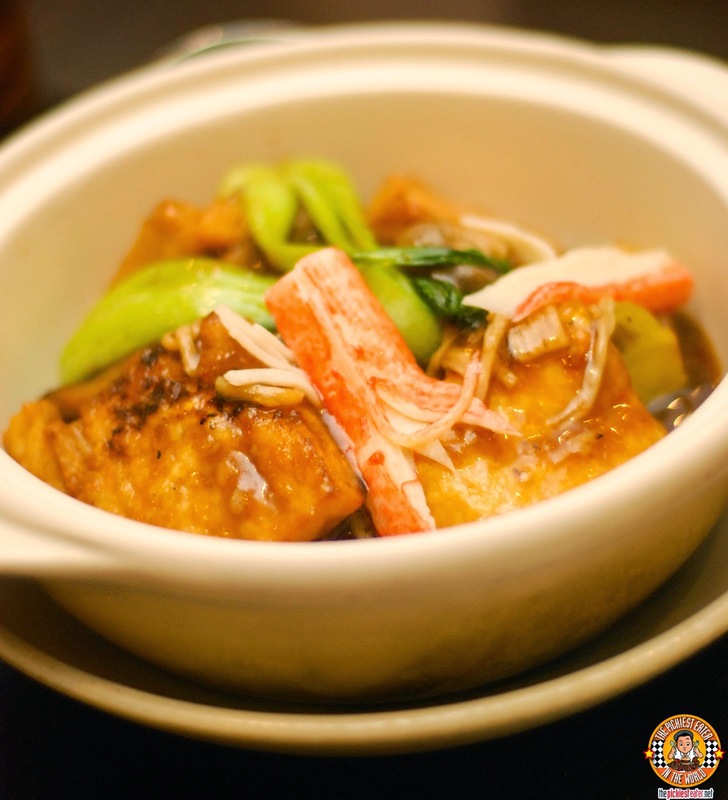 Hailing from the Guandong Province, the silky, delicate Tofu was cooked with a medley of vegetables and shrimp, in a thick ginger infused sauce in a Claypot. There is also an Egg Plant with Salty Fish Claypot variant, made with braised eggplant and Lapu-Lapu "Tinapa", but it was not presented to us. It sounds awesome though. 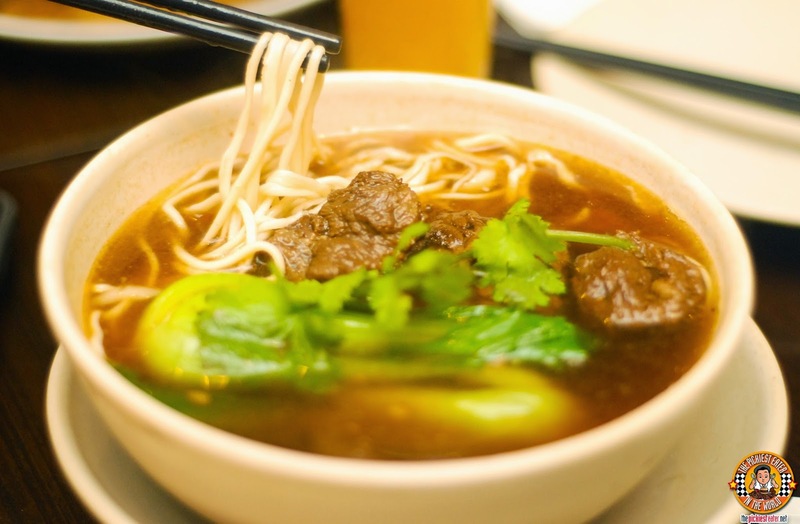 Before the Ramen craze exploded on to the Philippine food scene, Chinese Noodle soup was all the rage. Modern Shanghai's Soup Noodles with Braised Beef in Brown Sauce is perhaps one of the best Chinese noodle soups I've tried. The tender chunks of braised beef was remarkable, and went perfectly with the fragrant broth, with the hand pulled noodles cooked perfectly. This is exactly the kind of dish you look for on a cold day, or when looking for soothing comfort comfort. The Shandong Chicken was also a hit for me and Rina. The roasted chicken had a great juiciness to it. The flavor itself may not be as intense as the other dishes. However, once you pour its special sauce on to it, the magic happens. The mixture of soy and other herbs melds wonderfully with the chicken meat, making for quite a tasty dish. By coincidence, our hosts at Modern Shanghai served us their traditional Birthday Noodles (P298) for us to try. I'm a huge fan of noodles, so I was eager to try this - and I discovered its easily among the best I've ever tried. 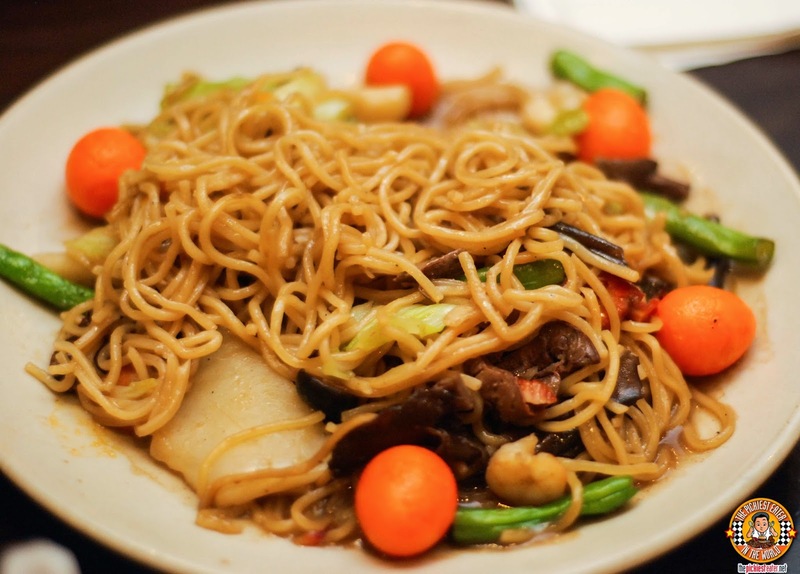 The Hand Pulled Noodles are stir fried with assorted seafood, meat and vegetables, and bathed in a special savory sauce. For dessert, we were served the Cantonese Sponge Cake (P128). 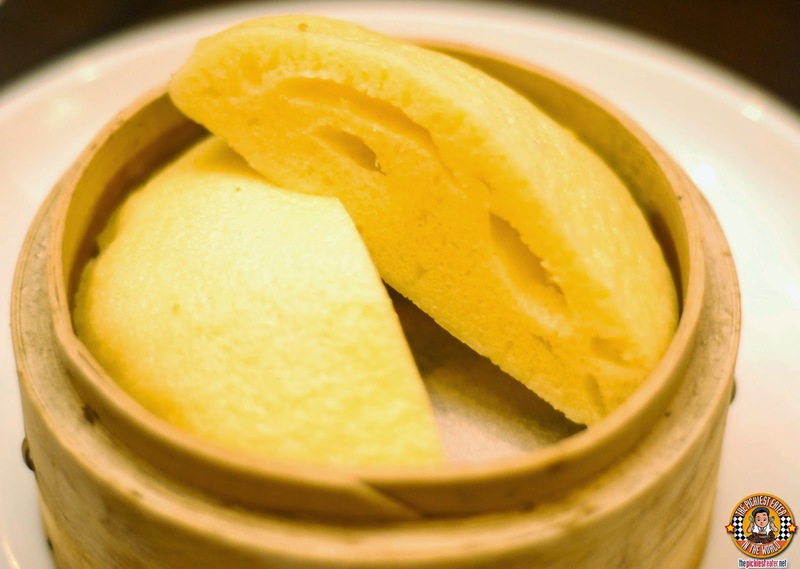 This is a traditional Steamed Brown Sugar Sponge cake that is kept moist in a bamboo steam basket. This wasn't really anything spectacular for me, and in fact reminded me or our native "Bibingka". 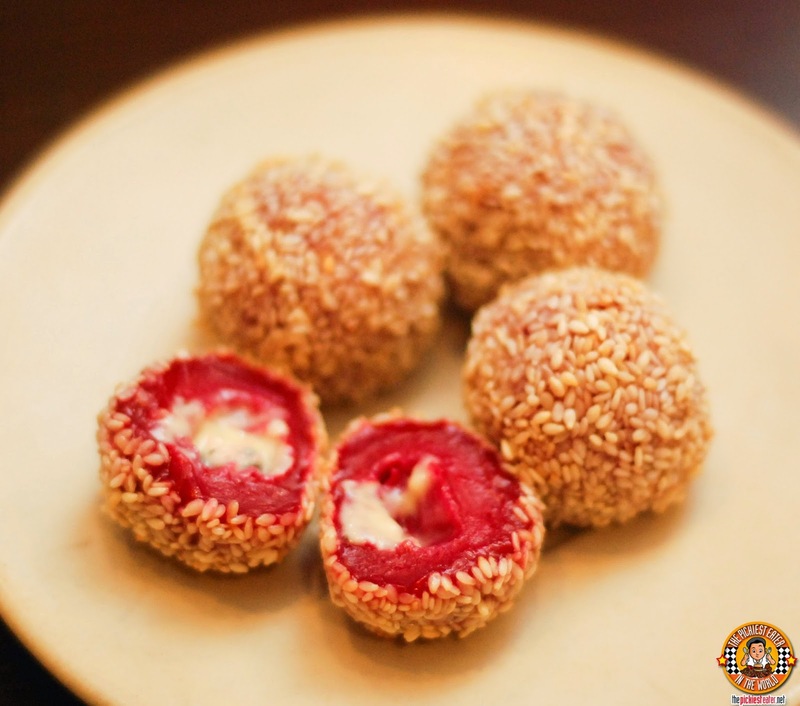 Breaking out from the "traditional" items, Modern Shanghai has come up with innovative versions of the classic Buchi. The first that we tried was the Cookies and Cream Buchi (4pcs for P208). The deep fried sesame seed coated balll is filled with a rich cookies and cream filling, for a delightful alternative to the classic. 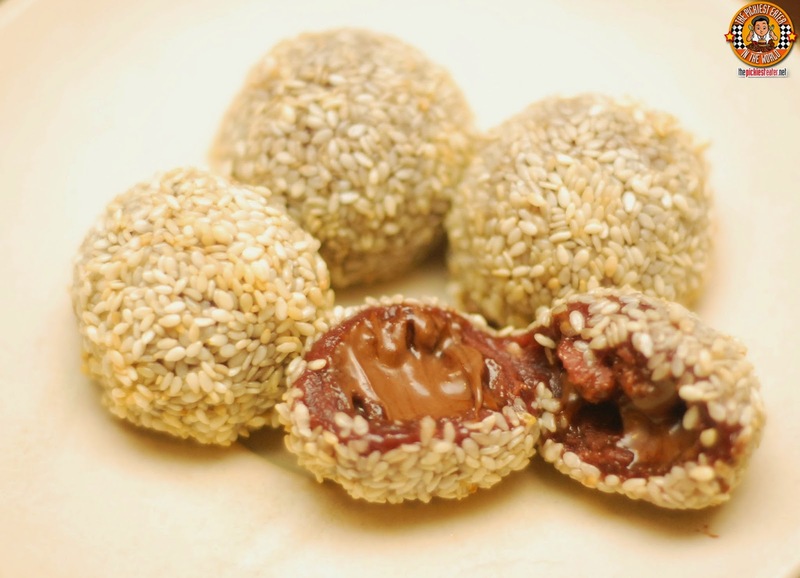 Another dessert that's poised to be a hit with Modern Shanghai customers is the Chocolate Buchi (4pcs for P188). And yes, it's as delicious as it looks! 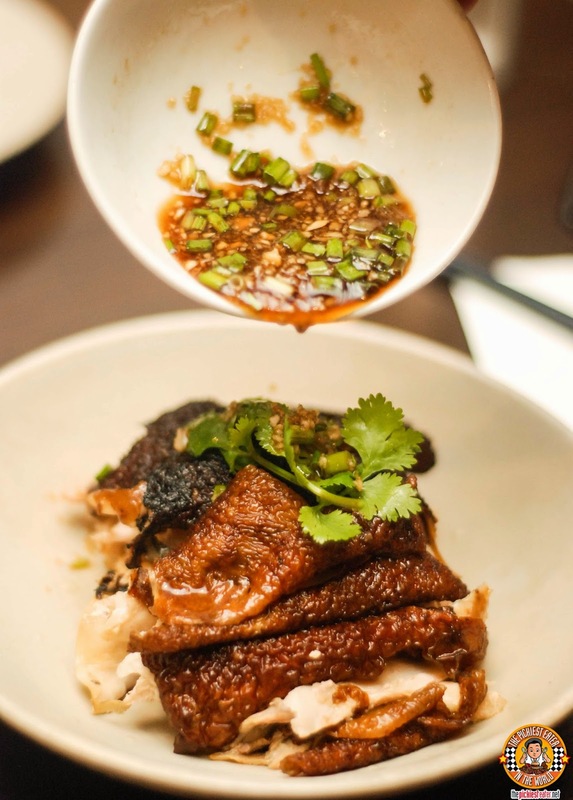 Being a member of The Bistro Group meant Modern Shanghai's service is of the highest of standards, while the quality of food itself was sublime. This was really the ideal place to celebrate my birthday with my dearest blogger friends! Much thanks to our wonderful hosts, Lisa, Kate and Chef Josh for a fantastic meal! Follow Modern Shanghai on Facebook!